Another use for your trusty bobby pins. This week, we continue to take a look at spring 2016 nail art trends. Designer Nicole Miller's spring/summer 2016 collection at New York Fashion Week drew inspiration from street art and New York City. Katie Jane Hughes, lead manicurist for Miller, created a paint splatter design to compliment the urban feel of the collection. Paint splatter designs look really cool, but can be difficult to achieve if you don't have the right tools or technique. Thankfully, Hughes used an item that most girls have plenty of to create her design—a bobby pin. You will want to create this design somewhere you don't mind getting messy. Lay out an old towel or a lot paper towels to protect any areas from polish. If you have a liquid latex product that you can apply around your cuticles, apply that and allow to dry before you start. A small container (like a shot glass) with acetone in it will help with cleaning the bobby pin throughout the process. To begin the design, choose your base colour and apply two coats. Allow to dry for a few minutes. For the splatter, start with the accent colour of the design and apply some in the loop of the bobby pin (where it bends on the one side). Quickly, before any can drip out, hold the bobby pin above the nails, and then blow hard onto the loop area. Depending on the consistency of the polish, how hard you blow and how far away the bobby pin is from the nails, you can get very fine splatter to larger spots and streaks. Continue doing this for each nail until you are happy with it. Add splatters using one or two more polishes that complement the first two colours. You can also go back with the first splatter at the end to layer the colours. 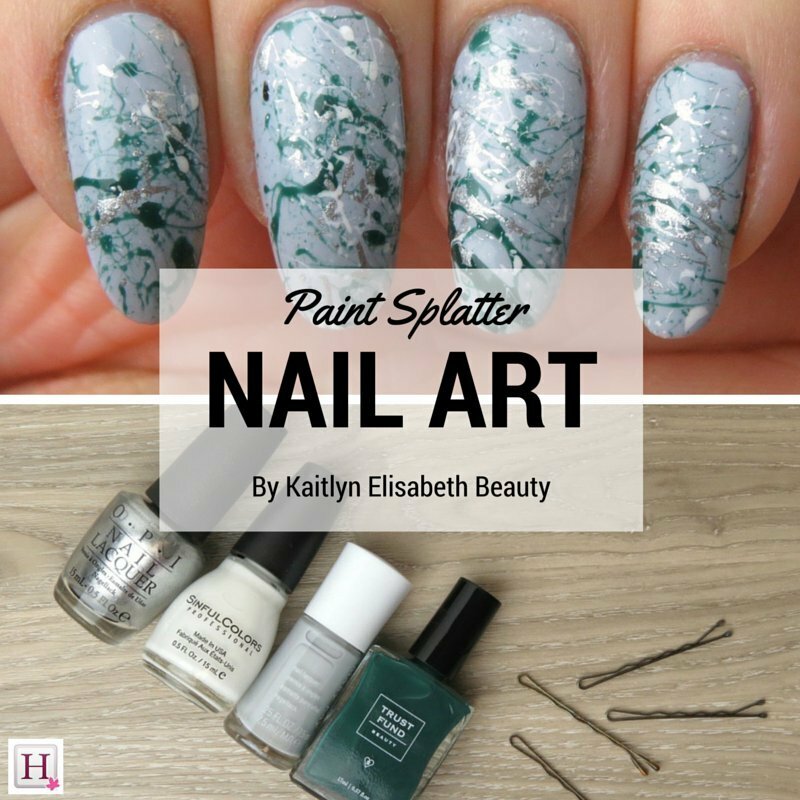 Allow the splatter design to dry for at least 10 minutes before applying top coat. While the polishes are drying, take a small paintbrush and acetone to clean up around the nail, as polish probably got everywhere. Kaitlyn Delano is a beauty blogger based in Toronto. You can find all of her Mani Monday designs on her blog, Kaitlyn Elisabeth Beauty.